There are some things I enjoy doing and others I just endure. And yes, there are certainly some things I avoid all together. I enjoy sports and games. The challenge and competition is exciting for me. Maybe this is my dark side and short-sighted weakness. But, I enjoy most every sport and game even if it is one that I’m not particularly familiar or fond of, I will enjoy it because of the competition aspect. I endure musicals. My wife loves watching musicals. One time I took her to see Les Miserables and somehow I ended up watching the back of my eyelids; she says I fell asleep. But I will watch musicals because I love my wife. I endure Disney princess movies. I have four growing daughters and this is their world. So, I am learning to endure and somewhat like princess stories because I love entering my daughter’s worlds. I endure camping. I’ve been camping a handful of times. Once I went camping on a missions trip to St. Davids, Canada. The shower stalls were filled with mosquitoes. Now, before you think I’m just being boojee, it was more than just swatting a few flies; there were cake clumps of nats that lined the walls and floors. It was enough to make you vomit. And because I forgot how fun that was, I planned another camping mission trip to Appalachia area in WV and had our group stay at a tent campsite. It rained about 50% of the week. Further, I grew jealous because there were cabins on the other side of the campground. So, I do not dislike or avoid camping but it is more like something I endure than enjoy. I have a fear that some Christians look at holiness like I do camping. Holiness is not your passionate pursuit. You might try to make more good choices than wrong ones, but holiness as an every day, moment by moment aim? No. 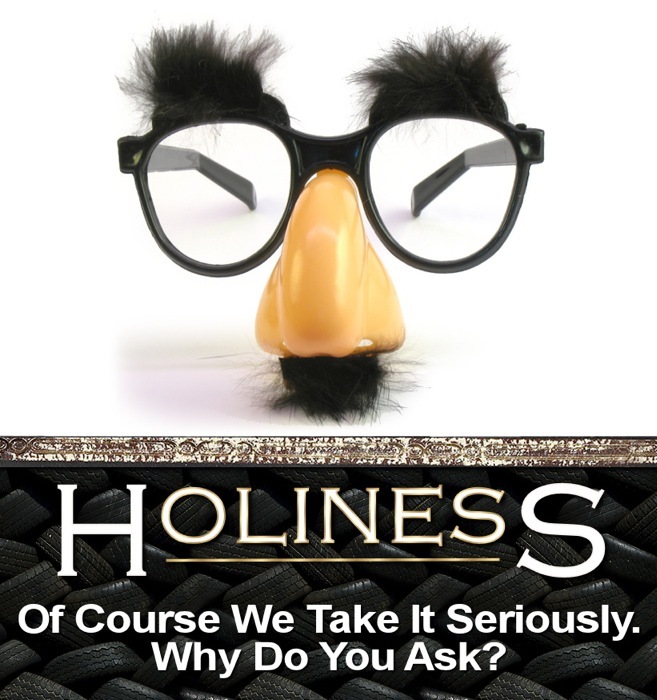 Yet, you expect holiness in your pastor and a few spiritual leaders in the church. You might appreciate that a few other Christian acquaintances somewhat emphasize holy living. But personally, you just seek to survive another day in the midst of all the stresses of life. In your life, holiness can wait. If this describes you then 1Peter has a word of challenge for you. Peter urges believers to be prepared [literally – “gird up loins”; has the picture of a worker or athlete tucking the lower part of robe around the waist so their legs could move unhindered]. Christians act for action – live as if you were in a war. Fear Jesus and seek His approval more than the crowd or the world’s. We live holy to grow up from spiritual infants to obedient children (1:14 – 2:8). Peter understood that these believers were experiencing great suffering. Their present and future circumstances looked bleak, in terms of comfort. If they did not grow up they would fall down. How does Peter describe growing up? Leave sin and love the Savior 1:14-16 as obedient Children, do not be conformed to the passions of former ignorance but obey God and be holy. knowing that you were ransomed from futile ways… with the precious blood of Christ (1:18) Every time you are tempted to sin look at Jesus bleeding and dying. Remember as Jesus died your sin has died (cf. Rom 6:1-11). In the Christian life, obedience is not an option and spiritual alertness is not an alternative. Believers must stay awake to the dangers of spiritual apathy. One of the greatest dangers is returning to past sin. Peter says “do not be conformed to the passions of former ignorance” (1:14). Proverbs 26:11 says, “Like a dog that returns to his vomit is a fool who repeats his folly.” (cf. 2Peter 2:21-22). Dogs return to vomit. Disciples of Jesus return to gospel victory where grace overcomes not just the penalty of sin but the power of sin to fuel obedience. Christians are called/commanded to grow in holiness. One who has been made holy by the power of the gospel cannot remain in an unholy lifestyle. “If we say we have fellowship with him while we walk in darkness, we lie and do not practice the truth” (1John 1:6). God has saved us from a life of sin and saved us to a life of holiness. Holiness is lived in humble community. When I watch the news I shake my head in disappointment and disgust. Human depravity grows increasingly live before our television screens. Sincere love and purity of heart is gone from society. And this is what Peter is exhorting these believers to go up against and live in contrasting ways. You think… oh, I’m loving and sincere. Have you ever stopped talking to someone (silent treatment) because they offended you? That’s malice. Have you ever puffed up your resume or when introducing yourself in order to gain acceptance? That’s deceit. Have you ever not stood up for Jesus or for the good of another when you had opportunity and power to do so? That’s hypocrisy. Have you ever wanted what someone else had (marriage, family, career, wealth, possessions, personality) that it impacted your present circumstances (feelings or reality in relationships, etc.)? Or worse, wished misfortune upon someone? That’s envy. Have you ever disagreed with someone and in describing the incident twisted the discussion even in the slightest bit to position self in right? That’s slander. You see, we are all guilty. Peter is saying “grow up”. How does Peter prescribe growing up? 2:2-3 Crave the pure spiritual milk. Peter says there has to be an exchange – “put away” then “put on/in”. Only the gospel of Jesus Christ can sustain your life and hope – especially in midst of suffering. Imagine if you only ate once a week. Imagine if you only charged your phone or laptop once a week. Imagine if you only fueled your car once a month. Imagine if you only cleaned your house & fridge once a year. The point is our hunger for God, gospel, God’s Word must be as great as our hunger for daily food, daily electronics charging, etc. A summary point of why Peter is emphasizing holiness is God’s mission for the believers. God saves His people from sin and for service. He has a purpose for them to proclaim His grace and promote His greatness in our lives. God’s missionary purpose is part of the DNA of the believer. 1) Priests offer spiritual sacrifices to God (1Peter 2:5). Believers offer their bodies as living sacrifices (Romans 12:1). Trouble is living sacrifices seek to crawl off altar. Believers offer sacrifice of praise and worship with the fruit of our lips (Hebrews 13:15). Believers can offer a sacrifice of wealth as a fragrant offering to God’s glory of good of others (Philippians 4:18; Hebrews 13:16). Believers can offer a sacrifice of prayer (Luke 5:33; Revelation 8:3). 2) Priests reflect God to the people. Speaking as God’s messenger of blessing, instruction, warning, judgment, hope/restoration. In OT kings were not allowed to be priests. Only Jesus was both noble and near. Jesus lives to make intercession for us (Heb 7:25). And now, God calls us a royal priesthood. We are all priests to reflect God to people and represent people to God through praying and seeing the potential for God to work in their life. The Israelites were a nation set apart and distinct with God’s presence, God’s promises, God’s provision, and God’s principles. They were to be God’s people and a light to other nations (Gen 12:2; Deut 28:12; Isa 49:6; etc.). Israel was to have influence around the world for the fame of God’s name not their own. They were chosen in God’s mercy not because of their merit; they were few and weak in number (Deuteronomy 7:6-8). Similarly, Jesus says that God’s people are salt and light (Matthew 5:13-16). Patriotism is in the gospel… until then they are exiles (1Peter 1:1). Survival in storms or suffering is synced to spiritual growth. Grow up in Jesus. Usefulness is united to holiness. Grow up in Jesus. Illustration idea from Jerry Bridges, The Pursuit of Holiness, p.93. Adapted from sermon by J.D. Greear, “Who We Are, Where We Come From and What We Do” 1Peter 2:8-12 from series I Am an Alien.